Professor Hannah Dahlen with mothers after the rally. One of Australia’s top childbirth researchers has condemned maternity services at Sydney’s newest major hospital, saying it has been designed with profit-making in mind rather than for the benefit of mothers and babies. Professor of Midwifery Hannah Dahlen was addressing local families and midwives from across Sydney at a rally outside the newly opened and privately run Northern Beaches Hospital at Frenchs Forest last Sunday, November 4th. 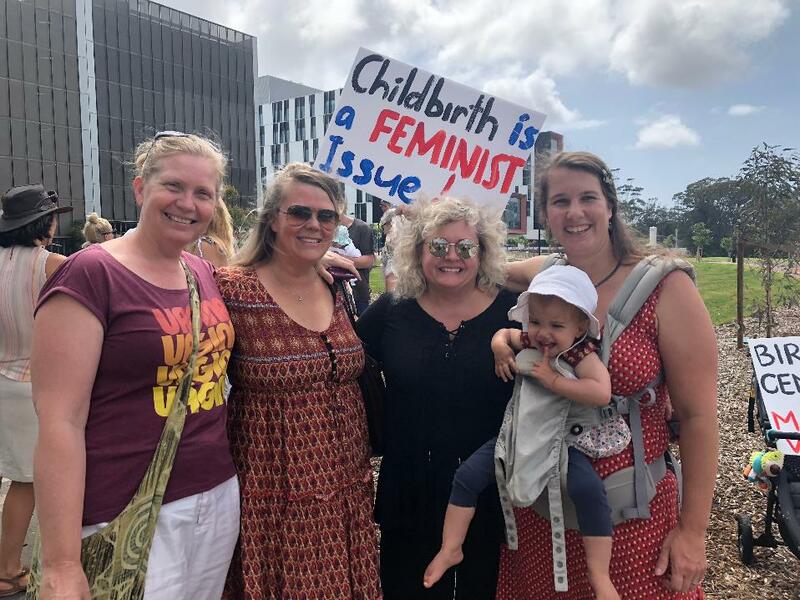 They were protesting for the establishment of a midwife-led birth centre at the new hospital along with the re-opening of maternity services at Mona Vale Hospital. Prof. Dahlen, from Western Sydney University, said the gold standard in childbirth services is midwife-led deliveries (known as Midwife Group Practice or MGP), which will be limited to 200 deliveries per year at the new Northern Beaches Hospital. She said executives from the hospital’s operator Healthscope, at consultations with midwives before the hospital was built, could see nothing wrong with the company’s high caesarian rate and revealed that midwife-led care would not be an option. However, an eight year-long study she had carried out following every woman who gave birth in NSW showed interventions were almost double in the private sector – even when older and other higher risk women were excluded. Healthscope sees its shareholders and doctors as their key customers instead of patients, she said. “You have now got the fox in charge of the henhouse,” Prof. Dahlen told a rally in support of public maternity services last Sunday morning. “You’ve got private health in charge of public health and they are not going to want you to look good. “So this is going to be a David and Goliath fight. Sheryl Sidery, Clinical Midwifery Educator and Mentor at Randwick’s Royal Hospital for Women, also said unnecessary interventions were less common with a midwife known by the mother and encouraged women to ask for their own midwife. "Pregnancy and birth is a feminist issue,” Ms Sidery told the rally. Local mum Adelaide – who went outside the Northern Beaches to access MGP because its availability is so limited - was there with her 7-week old baby Clementine. "Having that confidence going into labour was so, so important, and I think if we didn’t have that it would have been a very, very different start to Clementine's life and a very different start to our parenthood as well,” Adelaide said. “We felt very well supported having MGP and we want more MGP on the Northern Beaches so that Clementine and her brothers and sisters can have that start to life as well." Miranda Korzy, a spokeswoman for Save Mona Vale Hospital, who was announced this week as The Greens Candidate for Pittwater in the 2019 State Election, called on the NSW government for the reinstatement of the Mona Vale Hospital Maternity unit and other acute services before the state election in March. "We've all heard about the new hospital's food, it's views and artworks but women in labour now have to travel an extra 12 to 14km from Pittwater to Frenchs Forest, and for some, especially on second and later births, that will be too far," Ms Korzy said. On the issue of a public midwife-led birthing centre for the Northern Beaches, Ms Korzy said: "This is not some kind of hippy mummy's request or an extravagant demand. It is good practice backed by solid epidemiological research and the NSW Government must make sure it happens." Last to address the crowd was Helena Mooney from Friends of Northern Beaches Maternity. Restricted access to proven safe pain relief with only three birth pools out of 10 birthing suites in the hospital and only for public patients. Restricted access to proven, safe continuity of care through midwife-led birthing. Restricted access to postnatal support based on the day you happen to give birth – with none available on weekends. Restricted access to midwives in general with only three midwife antenatal clinic rooms at the new hospital. Healthscope has also axed midwife clinics that were meant to be set up at new facilities in Mona Vale and Brookvale. Professor Dahlen also said she was concerned that statistics collected at the hospital would be saved in its own private database and released only after two to three years – rather than annually as in public hospitals. The public would therefore face a lag in being able to gauge outcomes and quality of care for mothers and babies at the NBH. Birth centres are usually attached to a hospital and are usually run by a team of midwives who provide the majority of your antenatal care and attend your birth. Birth centres operate with the back-up of obstetric care so that if you need that extra medical care before or during labour or after birth, you can be transferred to the hospital. Birth centres offer a comfortable, low-tech environment where birth is treated as a "normal" process rather than a medical one. Birth centres are especially good at supporting women who want a birth without medical intervention. Birth Centres are considered the most appropriate location for low risk women to labour and birth. South Eastern Sydney Health Local Health District has the St George Hospital Birth Centre, Ryde Midwifery Group Practice (MGP) is a midwifery led model of care in a stand alone unit at Ryde Hospital. There are others within Sydney. NSW Health Mothers and Babies Report 2016 - published 15 February 2018 (Healthscope hospitals statistics included); NB: 'North Sydney Local Health District had double the rate of older women giving birth with 30.4 per cent of women who gave birth being 35-39 years old. Healthscope webpage 'Quality' states 'Healthscope supports transparent public reporting of healthcare quality data' - on this page 'Babies with a Healthy Apgar Score' is available.